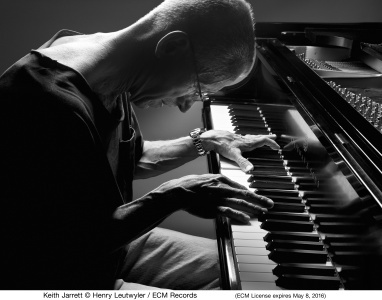 Keith Jarrett plays Samuel Barber’s Piano Concerto op. 38 and Béla Bartók’s Piano Concerto no. 3. These recordings, made in 1984 and 1985 in Saarbrücken and Tokyo, make a significant addition to the pianist’s discography as an interpreter of notated music. Jarrett’s recordings of classical repertoire for ECM have focused primarily on Bach and Mozart, though there are also exemplary albums of Handel’s keyboard music, and Shostakovich’s Bach-inspired Preludes and Fugues as well as a crucially important contribution to Arvo Pärt’s Tabula Rasa. Playing Fratres alongside Gidon Kremer, Jarrett’s participation would help to bring a then little-known Estonian composer to world attention. It was a richly creative period. Jarrett had just launched the jazz group with Gary Peacock and Jack DeJohnette that would become known as the Standards Trio and in parallel was giving classical recitals, and continuing with his solo piano improvisations. Splitting his time between jazz standards, the vast literature of classical music and free playing, Jarrett was juggling three different musical disciplines. But as Paul Griffiths points out in his liner note for Barber/Bartók/Jarrett there are some points of overlap. The concertos of Barber and Bartók “came from a world in which Jarrett was living; in a sense, they allowed him to speak of his own epoch, even while performing a work someone else had notated in detail. That they also belonged to a world in which jazz was living was part of the deal – though it was never the ‘jazz concertos’ of Aaron Copland, George Gershwin and others that gained Jarrett’s advocacy but rather works in which the jazz presence is more subtle, part of the background against which the music is taking place. The Barber performance also draws strength from Jarrett’s association with Dennis Russell Davies. Pianist and conductor had been friends since 1974 when they first collaborated in a performance of Carla Bley’s piece 3/4. Davies would subsequently conduct Jarrett’s Arbour Zena music on tour, record Jarrett’s solo piano composition Ritual and (in the 1990s) direct the Stuttgart Chamber Orchestra in Jarrett’s acclaimed recordings of the Mozart concertos. CD booklet includes performer’s note by Keith Jarrett, and liner notes by Paul Griffiths.